A common question we often get asked about when discussing the ordering process of our foil blocking dies is, what gauge size do I choose for my machine? Gauge is the measurement term for the actual thickness of the material. Regardless of the material chosen, across the industry there is a uniform array of gauge sizes available which are detailed in the table below. However, some die manufacturers choose not to offer all materials in all gauges, possibly due to un-popularity and/or manufacturing costs may make some sizes not cost effective. An additional consideration to gauge is Type Height, the measurement from your machines base bed to the impression contact point of your machine. Machines do vary, but for the most of machines there is standard set UK/USA 23.3mm height and an EU/Rest of World 23.5mm height which derives from the old letterpress format machines. Machines then usually allow for an additional makeready guide of 1mm-1.5mm. Type Height should be met with the thickness of your bed/heater plate and your stamping block. This is why many machines have either a 17mm or 16.3mm heater plate to function at Type Height with 6.35mm or 7mm respectively. Exceeding the Type Height could result in you causing damage to your machine and likely your block if you run the machine oversized. As an end user, sometimes you have the opportunity to order a different gauge size purely to save cost. Theoretically a thinner gauge material is cheaper with the majority of suppliers, but what can you do to achieve Type Height if your machine requires it? 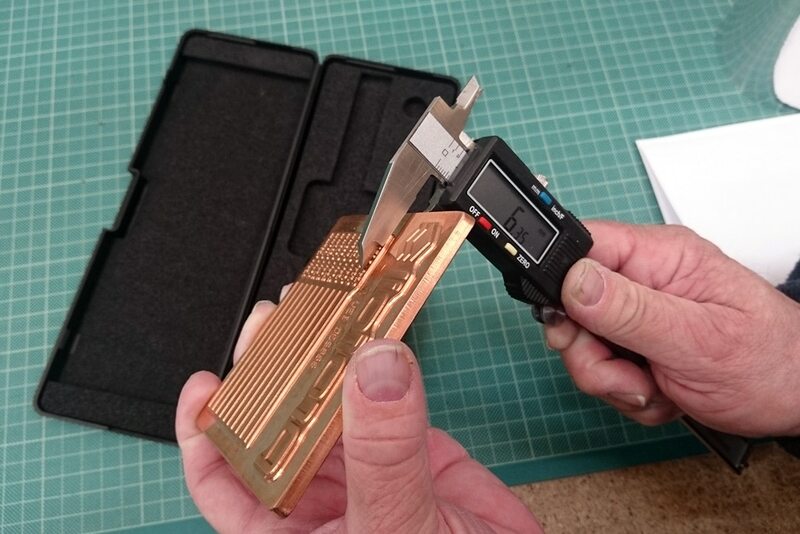 The answer is to utilise a separate mounting block which you can use underneath a thinner gauge block. You can repeat this process as you reorder more thinner gauges as and when required. However, you should remember that not all cost savings have benefits in the setup time for your job! Mounting in this way results back to using die bonding film, where registration is more challenging and you lose the benefits of toggle hook fastening with easy adjustment. If you have a hand press or semi-automatic vertical stamping machine, in most cases type height is irrelevant and the impression control distance is either controller by hand or based on contact pressure instead of distance. Here are some notes which you can use to help make your own decision on what gauge sizes are best for your job. This is the thinnest material available to order. It’s ideal for one time use and very common in the label stamping market because of the machines used often are pre-set for this gauge. Read more information here regarding what material to order for your foil blocking dies. Profoil manufactures foil blocking and embossing plates as copper dies, brass dies and magnesium dies in many different gauge sizes.